CPUSpy tests your processor and using an internal database of most common CPUs, displays CPUID data such as cache details, processor features and processor name (if supported) in a easy to read tabbed format. CPUSpy can also measure your current CPU speed in MHz, Windows Up-Time, IP address, Window Version, plus drive and memory status. In addition, CPUSpy has a cache speed test and all data can be saved in a HTML report file. Small tool for displaying the CPU clock, CPU usage, RAM usage! 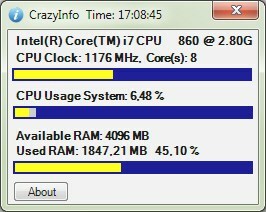 If you own an ASUS mainboard, use the CrazyInfo_ASUS.exe. You get additional infos about the CPU temp. and the CPU fan speed. First you must have installed Asus PCProbe. Then copy the CrazyInfo_ASUS.exe into the PCProbe directory and run it. Dr. Hardware 2009 is a powerful hardware detection program for Windows 95, 98, Me, NT4, 2000, 2003 and XP. It provides detailed information about processor, BIOS, SDRAM modules, sensor chips, mainboard chipset, SCSI, EIDE and PCI devices; Windows specific stuff like in-depth-analysis of file and memory management, VCACHE statistics, system monitor; also provides benchmarks for CPU, video adapter, harddisks, CD ROM/DVD, ASPI and net drives. HeavyLoad is intended to stress all resources of a PC (like CPU, GPU, RAM, hard disk, operating system, etc.) in order to test if it will run reliably under heavy load. This is useful for testing important file or database servers before using them productively, or just for checking if your new PC might get too hot when used intensively. 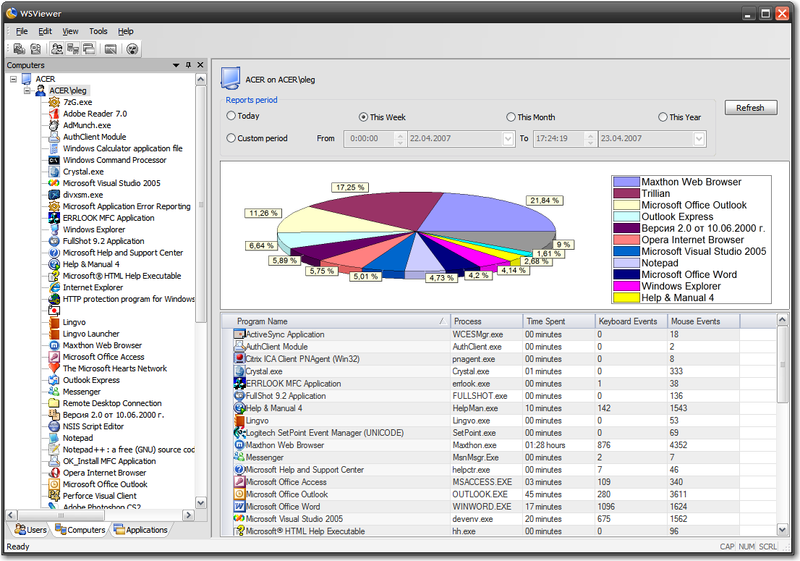 O&K Work Spy - Tool for collecting the exact statistics of what the user does in real time. The main purpose of O&K Work Spy is - How to evaluate what your employees spend their office hours on? How effectively do they use this time? What do they spend most of it on? The O&K Work Spy program is used to answer these and other questions. 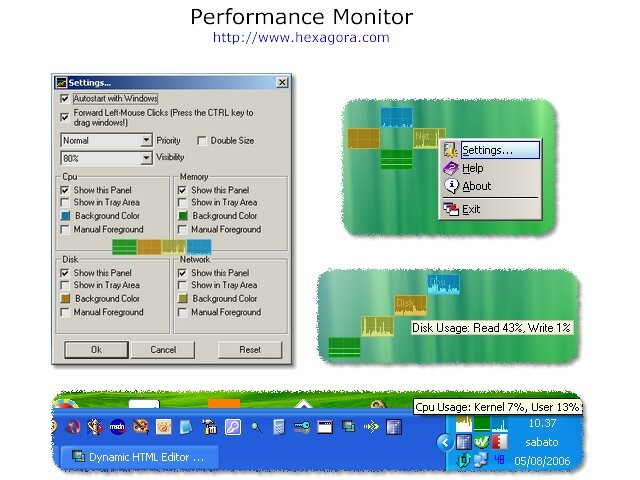 Performance Monitor is a program that shows you the CPU, Memory, Disk and Network utilization under Windows NT platforms (2000, XP+). It's composed by four fully configurable small graphs and it can work in the tray area also. The windows are fully anchorable and by moving the "CPU" window you'll move the other attached windows. PerfMon can become transparent and permits you to forward left-mouse clicks so you can place it anywhere. PerformanceTest enables anyone to objectively benchmark their computer by putting it through twenty-eight tests in six test suites, designed to cover all aspects of computing performance. Compare your PC's performance with built-in baselines, or download comparison data from a huge database of baselines from PassMark. Export results to a variety of formats. Customize tests to conduct in-depth performance analysis. Bandwidth speed testing at its best. This speed test software tests your maximum bandwidth speed by downloading files to max out your bandwidth. If you have a website you can test your uptime, response time, connection time and bandwidth. Speed Test also monitors your entire system performance and LAN performance. Don't wait, Download it now to get the freeware features.